La Belle Saison: Ohmigod, you guys, ohmigod! My Two AMAZING hen nights in London! My best and oldest friend Zannie had planned a surprise weekend away in London with her mum and 2 sisters - my mum was supposed to come but couldn't make it in the end - who are like my extended family. It was an ideal set up and, despite not having a clue about the trip until a week in advance, when I did find out, I knew it was going to be 3 of the most hilarious days ever (it always is when Zannie and I are together!). I'm sorry, I just need to stop here for a moment and say I'm really sorry if I've made spelling mistakes. My spell check doesn't know if it's French or English (probably a bit like my poor future children) and underlines almost every word in a red squiggly line. Ok, back to the story! 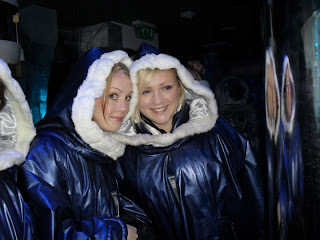 Our first night in london was spent having cocktails in the Ice Bar, which, for those of you that don't know, is a bar made almost intirely of ice. The bar itself, the tables, the chairs, the walls, even the glasses were made of ice, it was (I want to say cool but am trying to avoid making this very obvious pun) wonderful! Everybody going into the bar has to wear a special cloak with a hood and big ski gloves that hang from the arms on strong, like toddlers' mittens. I couldn't stop laughing (although this could also have been due to the cocktails we'd just consumed while waiting to get in) at how we all looked so odd in our electric blue cloaks with pointy hoods and how we all got really red noses after being in there for about 10 minutes. Of course what hen night would be complete without a tiara (or a veil) and a sash (or an L-plate)? Yes, Zannie and co dressed me up in a tiara, a flashing badge and a sash that said bride to be on it, and I happily wore it with pride. To be honest, I was just so relieved that there were no male strippers. (can you imagine what that would have looked like in the Ice Bar? What a disappointment, you'd have to ask for your money back!) After our 45 minutes in the Ice Bar were up, we said goodbye to those highly flattering cloaks and made our way to dinner at a lovely little Italian restaurant where much vino was consumed. Meanwhile the poor waitress was standing helplessly beside me, confused as to why I was covering my face with my hands and convulsing with laughter. I heard Zannie's mum, probably feeling sorry for the waitress by now, whispering across the table 'Linsey just blow the candles out!' but I couldn't uncover my face because the entire restaurant was now applauding and staring at me and I swear my face had gone into some hideous grimace as the laughter seemed to make me lose all control of my facial muscles! I'm not sure who did blow those candles out but soon enough the owner of the restaurant, a lovely little Italian man with rosy cheeks and a round belly, came rushing over and said 'it'z not your birthday?' I shook my head, having recovered from the loss of control over my facial muscles, and looked at him apologetically. 'No, I'm getting married,' I explained and held up the flashing badge which spelled out the words Bride to be in red and green led lights. He profusely apologised to us, and we profusely apologised to him, and it was all very embarrassing and awkward. The waitress then sheepishly made her way over and said she was sorry and that she had thought it was my 21st birthday (YES! 3 years younger!) and we all felt so bad because it had been such a nice gesture and no one had even told them to do it and they were apologising to us! We wondered if they would charge us for the tiramasu. They didn't. Oh! And the next night, despite the previous evening's hilarity making it a tough act to follow, was AMAZING. We went to the theatre and saw Legally Blonde the musical with Sheridan Smith and (the cheese King himself) Duncan from Blue. It was such a good musical, I can't recommend it highly enough and Sheridan was so good. She seems like one of those really down to earth actresses, talented, but not full of herself. Anyway since I got back all I want to do is wear pink and dance around singing 'Omigod you guys, Omigod!'. Other funny things that happened on the trip included me saying 'WOA' really loudly at the wrong time as the most enormously fat man walked by us (I wasn't saying it about him though! ), Catriona walking smack bang into a mirror in the mirror maze in Ripley's Believe It Or not! museum (also highly recommended - not to walk into a mirror but to go to the museum), Aileen falling all over the place as she tried to make her way through the revolving tunnel (which wasn't actually revolving), me throwing a hissy fit when I had to lug my suitcase (and wedding dress!) up and down all the stairs in the tube stations of London and, of course, our wonderfully hilarious conversation about 'fanny farting'. An excellent hen trip. Now only a month and a half to go until our civil ceremony in France and 2 months until our religious ceremony in Scotland. It's becoming so real...OHMIGOD! Yay! Sounds like a great hens night with some laughs for us blog readers. Welcome back to the blogging world and don't disappear... we miss your laughs. Sounds like a fab weekend! You always seem to get into these funny situations - make sure you keep writing about them! I am hoping to go and see L.B. soon, too so glad you enjoyed it so much!! Kiwi Aww I will try to stay on the ball this time! I do love my wee blog and my lovely blog friends! Sally I know, these things alllways happen to me, you'd think I made it all up but I swear it's true! :-) Legally Blonde was soooo good, I hope you get to see it with Sheridan Smith in it, she is wonderful! okay, after having met Susan and her mother, this post is WAY more entertaining! not that it wasn't originally, but in context...whoa. hilarity indeed! also, LB is one of my favorite movies ever so seeing this musical was amazing! not at all surprised that you loved it as well!